Chinese Foreign Minister Wang Yi and Panamanian Foreign Minister Isabel de Saint Malo attend a press conference, Panama City, Sept. 17, 2017 (AP photo by Arnulfo Franco). 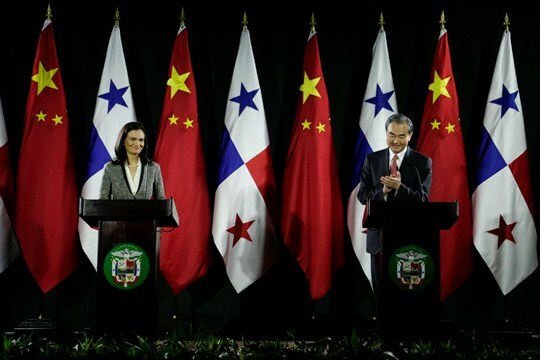 When Panama cut diplomatic ties with Taiwan in favor of recognizing China in June, it was an acknowledgment of the significant commercial interests China already has in one of the most important transport and financial hubs in the Western Hemisphere. It also opened the door for deeper Chinese involvement in Panama. In an email interview, R. Evan Ellis, a research professor of Latin American studies at the U.S. Army War College Strategic Studies Institute and the author of “The Strategic Dimension of Chinese Engagement with Latin America,” explains what’s behind Panama’s diplomatic shift, the opportunities the move unlocks and what it means for China’s wider strategy in the region. The views expressed in this interview are strictly those of the author.